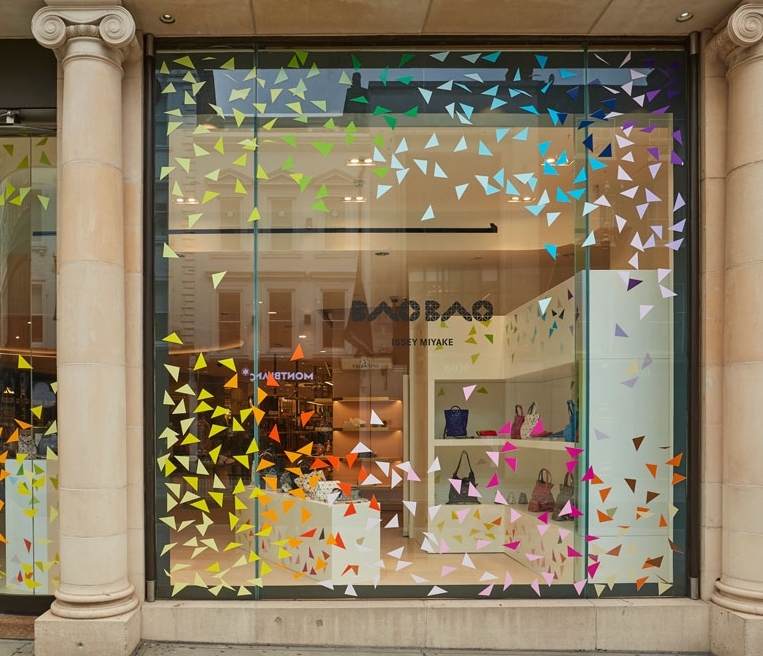 The design for the Issey Miyake pop up store at Fenwick Bond Street came direct from Japan with Propability adapting various elements to make it work in store. A minimalistic corner shelving unit was created with clean simple lines in flat matt colours to showcase the range of handbags and accessories. Although the piece was made in separate sections and put together in store there are no visible joins which helps to create the clean and angular visual appeal. Two floor standing plinths to display merchandise and a smaller tall window fixture were also supplied together with matt white vinyl applied to the glass of the window and to the fixtures. Triangular shapes inspired by the range of bags in a range of colours are scattered across the entire scheme.